ProDrive bring the Impreza back from the brink - and Gronholm out of retirement - for the next round of the World Rally Championship. In what could be called a spike in Subaru's WRC flatline, Prodrive has released an image and details of its Rally de Portugal contenders. In a one-off appearance, two-time World Rally champ Marcus Gronholm will be hauled out of retirement to drive another recent pensioner, the now-defunct Subaru World Rally Team's 2008 Impreza WRX STI. "It's okay to come back again. Everybody is looking at me, and maybe I'm stupid, but to have fun and drive again, why not?" Gronholm told wrc.com last month. "I will not start aiming for the win, as I want to compare my speed with the regular WRC boys over the first few stages. The important thing is to feel confidence and pleasure, coming back to an event that I enjoy very much and know the stages quite well." "I hope we can do some little bit good times - that's the aim." The Impreza successfully completed its first shakedown two days ago, and Gronholm will familiarise himself with the a test car in Wales later this week before a full two day pre-event test in Spain next week. Gronholm will have three days in total with the car before the rally begins on April 2. Gronholm, who has won 30 WRC rallies over his career, finished fourth in 2007 for Ford (see in-car video below) and drove the safety car in 2008. However, he has not driven a WRC round for 16 months. "In a perfect world, Marcus would have had far more time behind the wheel, however, with his years of experience, I am absolutely confident he will very quickly find a rhythm in the Impreza," said Prodrive technical director, David Lapworth. "We have only been able to make minor changes to the car because of homologation restrictions, with the most significant difference being the Ohlins dampers." 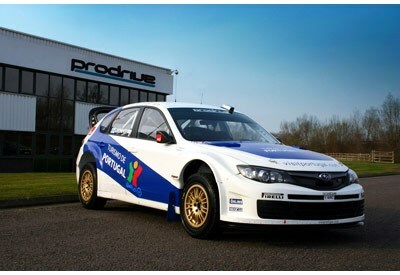 The car has been entered under the Prodrive team name with funding and support from the Portuguese Tourist Board and rally sponsor Vodafone, as both car and driver are a major attraction. Prodrive will run the car with sister team Adapta WRT. Gronholm will compete against former teammate Mikko Hirvonen and old foes Sebastien Loeb and Petter Solberg - the latter formerly of Subaru, but now driving a privately-entered Citroen Xsara. The swapping of cars and drivers is a shake-up that the WRC desperately needs, with only two manufacturers left in the sport after Subaru's shock exit at the start of the year. As for Gronholm and Prodrive; neither are ruling out future WRC round possibilities. "It's a one-off at this time but we'll see if he likes it," said Prodrive director Richard Taylor. Back in the WRC calendar after a year out in 2008, Portugal returns as one of only four events this year eligible for the WRC, P-WRC and J-WRC competitions. Portugal is country with a long rallying tradition. The first Portuguese round of the WRC came in 1973, and for the next 29 years the event went on to become one of the most difficult and notorious rallies on earth. The event earned a reputation for tricky road conditions (often a mix of gravel and asphalt) and unruly crowds of spectators. Most of the pictures showing people swarming around Group B cars as they drove by at full speed were taken in Portugal. In more recent years Portugal was a gravel-only event, based on the west coast near Porto, but in 2001 it was dropped - replaced on the calendar by Rallye Deutschland. In 2007, after two years of candidacy, Portugal's return to the WRC represented a fresh start. The new-look rally moved to a new host town, Vilamoura, in the Algarve holiday region on the south coast. The event base is the Algarve Stadium, where two Super Special stages will be held, while the spectacular gravel stages are located in the Algarve and Alentejo regions.